As well as having a stable formation over these matches, they played with pretty much the same XI. Some of the Nuno’s different options are shown above. Fuego drops back between the centre-backs. This forces Elche’s 4-2-3-1 into a 4-4-2. “Playing out with three at the back is very useful because it conditions the response of your rival. Even if they press you, it’ll be with the centre-forward and the second striker, obliging them to move into a 4-4-2 shape and you can therefore overrun them by achieving superiority” Pep Guardiola. This is exactly what is happening here, the no. 10 follows Fuego back, giving Valencia 3vs2 superiority, making them difficult to press. Valencia will generally build up in these areas with shorter passing as they don’t have much height among the forwards with Feghouli (in this match) being the tallest a 5’10”. Seven of Fuego’s nine attempted passes into the opposition half were unsuccessful. Interestingly, when Fuego (circled) drops between the CBs, and the fullbacks push up, Valencia’s 8s are deeper than the fullbacks. As the ball is switched using this situational back three, space opens up on one side of the field which Perez drops into. Turan cannot press Perez due to Gaya’s positioning on the left touchline. Slightly out of the left of the picture, we can see that Gaya cannot be pressed by Juanfran, Atleti’s LB as Piatti is in his zone. This is an efficient way of breaking Atleti’s first line of press from their strikers. Feugo in space between Atleti lines. Another build-up variant is where Fuego doesn’t drop between the centre-backs, instead standing in the inevitable space between the midfield and attack when playing vs a 4-4-2. Atleti’s front two press the Valencia CBs but Otamendi (circled) can find a pass to Fuego as Valencia have 3v2 quantitative superiority in the form of a triangle this time. They have broken the first line of press and Fuego has the space to turn and run forward with the ball. Atletico are forced to drop twelve yards. Fuego plays it to Parejo who can run with the ball further into Atleti’s half. 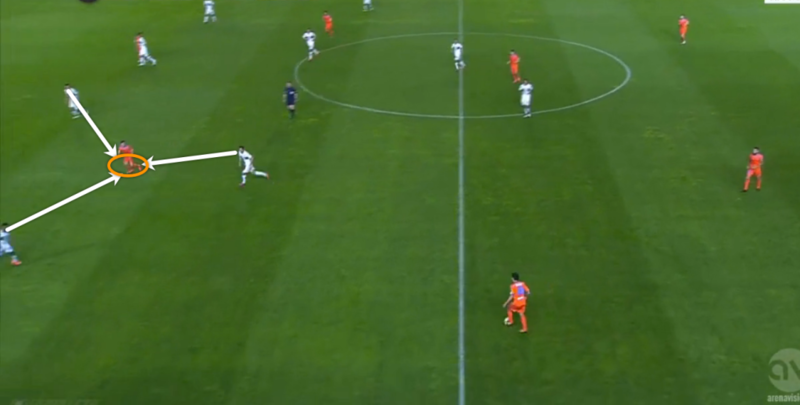 Barragan is open in a high left position and Parejo can play the ball to him. Valencia have made it into the final third. Playing through the middle like this is a more effective strategy vs a team like Atletico who press well in wide areas. Here, they can have the best of both worlds with Fuego (circled) dropping into the back three, while also utilising that central space that opens because of this. Notice how it is Perez who is in the space, showing on this occasion they will look to create superiority on their right side of the field. Paco Alcacer between vertical and horizontal lines. Above we can see Paco Alcacer exercising a common feature of Juego De Posicion, situating himself between the vertical and horizontal lines of Elche’s defence. This makes him difficult to mark and also creates space for hs teammates as here we can see he is attracting the attention of three Elche players. This creates confusion as to who is supposed to be picking up Alcacer which gives Gaya lots of extra time on the ball. Alcacer stays in the triangle. As the ball is played from Gaya to Piatti, Alcacer stays inside this triangle and Damian (Elche’s RB) chooses to track Paco’s run instead of pressing Piatti, giving Piatti lots of time on the ball. Another example of Alcacer’s positioning giving his teammates space. Valencia positioning in between lines causing more trouble. Another example of good positional play from Valencia as Gaya and Piatti (circled) are in positions in between the horizontal and vertical lines of Atleti. This leaves Juanfran and Turan double-occupied. Otamendi is on the ball and Perez is his short option. Gabi can either press Otamendi, but compromise his good position in relation to Perez, or he can close down Perez but this would open up the passing lane to Piatti in Valencia’s left halfspace. Valencia create these situations often but fail to capitalise on them most of the time as they are laboured in getting the ball into Gaya and Piatti. Piatti makes a run wide. Piatti now in Damian’s zone. Piatti makes a run wide. This gives Gaya an option on the flank, in the halfspace, and in the centre(ish). Piatti position forces Damian out to press him, opening a passing lane behind the defence to Alcacer. Gaya plays high pass over the top which is held up by Alcacer and played to Piatti, who characteristically runs from deep positions into a crossing area. Meanwhile, Valencia have overloaded the wide right with two players. This will either mean they are left free at the back, or they are marked leaving space in the centre–in this case, both happens. The ball is played to the back post, and Feghouli has a free header which is saved. It falls into Gomes who is completely unmarked and can score. Valencia attackers in between the lines. In an attempt to exploit the central space in between the defensive and midfield lines of Atletico, they push the fullbacks up, thus bringing the wingers into the halfspaces. These five players (including Alcacer on the last line) are impossible to press because of their width, and that there is 5vs4 on the Atleti backline. Valencia create a wide 3vs2 overload. Perez pushes up to create a 3vs2 overload on the left wing which is facilitated by Negredo attaching himself to Godin. This continues this numerical superiority, meaning they cannot be marked as this would leave one completely free man. Valencia are 4v4 on the Atleti defence. Valencia are 1-0 down and the game is moving further into the second half (63 mins). They commit 4 men onto the last line with three of them grouping in the centre. This opens up space between the Atleti fullback and centre-back. Rodrigo crosses to far post. Rodrigo, who is left footed, came on at right wing as an inverted winger. Characteristically of an inverted winger, he cuts inside onto his favoured foot. He has a spare man to aim for as Negredo’s forward run has pushed back the three Atletico defenders. Paco waits deep for a pullback. Piatti mostly stays wide in the final third, not just due to the fact he is reliant on his left foot, but to create qualitative superiority against Damian (the Elche RB). Feghouli runs into the area, pushing back the defence, while Alcacer stays behind to give the option for a pullback. A similar situation as before as Piatti is in a crossing position. Alcacer makes the run forward this time, and Feghouli can recieve the ball in space and make a shot on target. ….and whacked right up to the big man. This was more of a routine straight from kick-off rather than an actual strategy but it is important to note Negredo gives a different option to Valencia’s other options. Classic long-ball tactics as Negredo wins the flick on, while the winger makes a diagonal run into the space vacated by Giminez who is challenging Negredo. Negredo’s flick in is just too heavy for Piatti but it nearly proved successful. …This forces the ball over to the other side where Valencia have numerical superiority and all options covered, Elche are forced to play long and lose the ball. The Elche man receives the ball on the touchline and Valencia see this as an opportunity to win back the ball. Feghouli and Barragan press the man on the ball, while also, with the touchline acting as the 3rd presser. Alcacer and Parejo offer secondary press on the close option. Mustafi (circled) is following a dropping player tightly. Valencia force a turnover. Valencia press in a 4-2-4 shape. Valencia press in a 4-2-4 shape with the centre-midfielders moving up depending on what vertical column the ball is in. The front line of four provides pressure on the defence while also blocking passing lanes into midfield. The two in midfield allow Valencia to play in a mid-block without leaving space in between lines. Pressing the Atletico centre-backs 2v2. When pressing in a 4-1-4-1 vs Atleti, the centre-backs are again pressed by Valencia’s 8s in accordance to what vertical column the ball is in–the ball is in the Atleti left-centre zone, so Parejo, the RCM, presses. Tiago has moved into the area that Parejo has moved out of, so Fuego pushes up, ready to press Tiago if he should get the ball. This 2vs2 press proves successful as Godin is forced to hit a long ball, which finds Diego Alves. Valencia wingers in deep positions. Atleti are a team based on wide buildup and use overlaps from fullbacks to create wide overloads. Valencia defend against this by dropping the wingers, with the 8s further forward providing pressure, creating a Christmas tree shape. Fuego is covering the space in front of the defence. Perez presses while the wingers are deeper. The above images sum up the previous two things we have seen. Perez presses Giminez as they ball is in his vertical column, while the Valencia wingers are deeper in accordance to the slightly higher positions of the Atleti fullbacks. 4-3-3 in organsied defence vs Elche. Against Elche they favour a slightly different approach when defending in their own half, positioning themselves in a more orthodox 4-3-3 shape when the ball is in the middle third. Valencia recognise that they pose a threat in between defence in the midfield lines as they play with a no. 10 so Valencia play with these two lines very close together. The wingers provide pressure in higher areas, with this higher position also being beneficial in an event of an attacking transition. As the ball is worked into the final third, Valencia move into a 4-1-4-1 shape. Their back four is very narrow and Fuego covers the space in-between the lines as the midfield line of four try to push Elche backwards. Valencia’s back four are position oriented with Mustafi being the vocal presence, dictating the height of the defence. Subsequent to a throw-in, Valencia are heavily pressing Turan on the touchline from three angles, in addition to Perez and Gaya being tight to Garcia for the secondary press. Barragan and Feghouli have become more narrow and more advanced to prevent a switch from Atleti, enclosing them in a small area of the field. Feghouli’s positioning, as well as being defensively useful, would give him a good starting position for an attacking transition. When Atleti have the ball in the middle thirdle, Valencia’s back four are still relatively spread out. A misplaced Atleti pass falls to Gaya, and he can switch the ball to the other flank via Mustafi and Barragan. This allows Valencia to exploit the space on the other side of the field. …and play it to Negredo. One benefit of playing Negredo is that he can be used as a long ball option, especially against a team that can counterpress well, such as Atleti. This long ball was a fairly successful ploy during the match as he won 8 aerial duels. They also look for him in attacking transitions with low passes, with him acting as a hold-up player. This is contrasted to Alcacer who prefers diagonal runs onto passes behind the defensive line. Valencia always look to go forward when they win the ball. Their 4-3-3 is beneficial for this as teams often leave two central defenders back when they are attacking. Feghouli and Piatti’s pace mean they can create 3v2 situations in transition before the opponents have a chance to get their fullbacks back. Quick transition from a defensive corner. If you scroll down to the set piece section, you will see the man circled in black from a defensive corner. Alves catches the ball from a corner and rolls it out immediately, with Valencia players moving wide to attempt to stretch the retreating defence. Valencia again showing their willingness to play vertically when possible. Valencia counterpress often, with the commitment to the counterpress depending on how high up the field the ball is. Valencia lose the ball and Elche attempt to play the ball into the middle third however Rodrigues is tightly marked by Gaya. Rodrigues is forced to play back to Damian. Valencia now employ an option-orientated press with one man pressing Damian on the ball. Damian is forced to clear, and Valencia regain possession around the halfway line. More counterpressing, Mandzukic pressed from behind. Tiago is pressed, while Mandzukic covershadowed. In the first image, Atleti have just won the ball, and Mandzukic is open. Parejo (instead of dropping off) shows Valencia’s intent to counterpress by pressing Mandzukic from behind, restricting the Croatian forward’s ability to turn. Mandzukic lays it back to Tiago, and Parejo carries on his press (also cover-shadowing Mandzukic), so Tiago is forced to make a quick pass to Turan. Barragan presses Turan who is forced into an error. Valencia win a throw-in in the opposition’s half. Atleti regain possession on the halfway line. Juanfran is contained from three angles. Juanfran is guided into a blind alley. Valencia lose the ball and it is played to Juanfran, on the ball in the picture. instead of actually making any challenge to win the ball or slow down his attack they simply close him down from three angles, cover shadowing any options, and making it difficult for him to turn. They keep up this three way tracking until he is clearly running down a blind alley and they can shepherd him into the corner where he is tackled. …until they find their defensive shape. Valencia lose the ball and Feugo goes immediately to press to slow down the attack. As another player comes into the vicinity Feugo has to drop slightly to be in proximity to both players. Notice the higher positioning of the fullbacks, ready to press if the ball comes to each side/attack if the ball is won. The attack is held up well, Valencia manage to get midfielders back and three of Valencia’s back four settle into their defensive positions, while Gaya presses. An attacking corner for Valencia, taken by Piatti. They have two men in the six-yard box and two near-post runners. This near post run opens up a chasm of space in the middle of the area, which the ball is played into. Mustafi’s shot is deflected in by Alcacer but correctly ruled out for offside. Valencia man-to-man mark from corners. The white circles shows this. They have two players zonally marking on the edge of the six-yard area and one man free on the line. The player circled in black is positioned so he can track any players running for the short option, or close down a player on the edge of the area if they ball is cleared. Also, his advanced positioning is beneficial for an attacking transition. Valencia form a line which drops together, however there are two players slightly ahead of this line that do not drop. They perform a similar role to the more advanced man in the defensive corner. They will press if the ball is cleared, as well as being beneficial in attacking transition, as shown below. The free-kick is overhit and Valencia look to counter. Valencia are sometimes over-reliant on Fuego in build-up and come unstuck against some clever defensive play. Raul Garcia is in a tactical area where he is stopping the option of fuego while also being within proximity of pressing Otamendi if that pass were to be played. Mustafi is forced into a clearance which is blocked by Torres and goes out for a throw. Barragan and Parejo are also being intelligently pressed. Even when Barragan does get a lot of space on the ball due to Valencia’s clever build-up play, his delivery is poor. Chance to play a ball behind the defence. …but Negredo can’t get to it. ith Negredo on the pitch, it is harder to find space in behind an opposition defence. Here, a similar situation arises to the Elche with Alcacer-in fact, exactly the same situation. A just as good ball is played but Negredo can’t get to it, Alcacer probably would have as he did in the previous situation. Atleti concede from a corner. Poor defensive organisation from Valencia. The whole defence gets pushed back from Atleti’s runners and Feghouli doesn’t stick to Koke who runs straight through him into the space to score. Just a combination of poor concentration as they are all appealing for a handball instead of chasing down the ball, poor organisation, and poor defensive awareness from Feghouli. In conclusion, Valencia are a team that build-up play well, and are orientated around crossing through creating superiorities in wide areas. They always look to counter-attack if they have the chance. They defend very well in all areas of the field, and have two very proficient centre-backs. Valencia’s fantastic unbeaten run has now finally come to an end against Barcelona, and will be hopeful of securing a Champions League place, thus returning to the competition for the first time since 2011. Would be nice to see this type of analysis done on teams from different leagues, to show the contrasting approaches to the game. (Premier league teams are very different to La liga or Bundesliga teams, for example). I know an analysis like this one takes an awful amount of time, but this website and the work you and your colleagues do fills a massive void as far as football analysis goes. We all appreciate the effort and time put into making these wonderful articles. I don’t see this kind of thing done on tv by people who are actually paid to do it. very good analysis! It would be great if you could make a similar analysis for Barcelona ahead of its match with Bayer. Or an article of areas of comparable strength and weakness of the two above mentioned teams. That would help the readers of the site to have a better understanding of the game! I’ve got commitments and stuff so I won’t have time to create a Barca analysis before that particular fixture however there will no doubt be a post-match analysis of that match on here. Great analysis, the screenshots also help a lot. Idk whether you speak german, but if you´ve read the various team analysises on sv.de yours is a quite different approach, focussing a lot more on single scenes and greatly analysing them, whilst on .de there are mostly the bigger structures und stuff explained. Maybe this difference comes from the impossibility to use screenshots on most analysis. I for myself very much like the analysis, also to me there´s, away from understanding the valencia-team, some personal gain in understanding group-tactical movement more in-depht. What do you think of Cancelo? Idk why he plays so seldom, whenever I watched him he was great, especially vs. Levante, would love to see him as new right back in Barcelona next year. Also de Paul sometimes shows great potential, incredibly good needle-player if used in the right way, but with other big weaknesses though. For the possible loss of Gaya: I´ve heard that Salva Ruiz shall be very talented, probably the fourth left-back coming through their ranks in recent years. I think Cancelo is a good talent for the future and is a good attacking option from fullback however it is a bit of a risk playing him over someone who has a lot more experience. He has only started against poorer teams since Valencia have been on their good run and has been brought on as he was Vs Barcelona when they need a goal. Yes I do like De Paul but there isn’t much chance of him playing at left wing with Piatti in the side. Never seen Ruiz play but my guess is that they will re-invest the money they get from Gaya. Valencia have definitely been a team to watch this season! Looking forward to see in which direction the club will move in summer and in further future. btw: in the second screenshot you most probably mean Parejo is in space, not Perez. Thank you! Looks like Gaya and possibly others will leave so it’s interesting to see how they adapt to losing players. I hope they can put their loss to Barca behind them and finish fourth as Champions League football will obviously increase their ability to keep their current players, and maybe attract some new ones. Nice profile, please do team & league profiles too. I personally advocate this style so it’s nice to see it. 2-3-2-3 for space control & close pass options. Then 4-1-4-1 in defending. Thanks :). Yeah this type of 4-3-3 is my favourite system too.